Since I last blogged about the BBC's iPlayer, there's been developments but the access still leaves a lot to be desired. People might remember that I complained about the trying to find a needle in the haystack, when attempting to source signed programmes. The BBC's Access 2.0 picked up on my comments in this blog post. It seems the BBC has finally listened (yay!) and now has a Sign Zone category. Finally we can find programmes, to actually watch. Subtitling has been riddled with problems within the past year, and for months we were without any subtitles. This was actually difficult to get the BBC to take any note, and for months it became talking to a brick wall. Replies you got were along the lines that painted you as a dunce, not knowing how to turn the subtitles on, instead of an end user who was capable of navigating and seeing something different. The programme information pages will let you know if subtitles are available above the Download button – if they’re available you’ll see Includes optional subtitles. Click on the S button, which will only appear when subtitles are available, to make any subtitles viewable. If you have problems watching subtitles in full-screen mode, make sure you have the latest version of the Download Manager. More information here, including turning on subtitles in Windows Media Player. That's the theory, important read under the next sub header! Subtitles in Practice - Labelling content as subtitled when it is not! That is the latest version of iPlayer, and I know the S button works because it has been displayed for programmes that has actually contained subtitles. There's more, but you get the picture. I've downloaded well over 4gb of supposed subtitled programmes recently, and only one of these programme was subtitled. Without subtitles I cannot access programmes, its as simple as that. Yet I'm expected to trust the BBC's access information, take the trouble to download something, to find out this information is wrong. So I take a chance with another programme, and another and the same mistakes are happening. This all uses bandwidth. If that goes over my ISP limit I have to fork out additional charges, not to mention the power used perform these tasks. The BBC's negligence - because that is what it is, make no mistake about it - costs me money. Its not a one off mistake to forget to add subtitles, its recurring to the extent that the system cannot be trusted. What's happening here? The BBC labelling programmes as subtitles to tick off some target, or something not co-ordinated? At present, subtitles are only available for downloads, although we are working on making subtitles available for Click to Play (streaming) from early 2008. The BBC missed that target then, since early 2008 has been and gone! Going forwards, next on the roadmap is adding subtitles to iPlayer streams, which is something we're working hard on and hope to have ready some time in June or July. After that we'll be looking at the possibility of making subtitles available for iPlayer on other platforms, such as the wii or iPhone. We'll also be looking at the possibility of providing subtitles for those programmes which use live subtitles or those time-sensitive programmes which tend to change minutes before transmission. That's a whole new challenge. That is good news, and I would certainly like to see subtitles available for Wii. Currently, we have two lots of downloads happening in my household - my family accesses iPlayer via Wii, and me via a download button (often to discover the subtitles aren't there). This puts pressure on bandwidth load, because I cannot watch iPlayer with the rest of the household. Why should we have to download something twice, because of a lack of access? However, there's a case of part wanting to tell the BBC to walk before it can run here. Sort out your current problems first, because labelling is laughable. Its annoying. It cannot be that difficult to fix? Be honest, tell me its not subtitled before making me download. BBC on YouTube, but where's the subtitles? 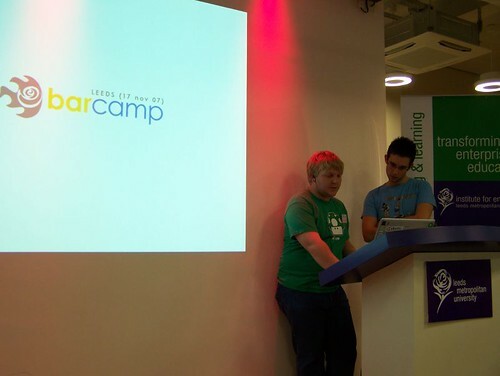 I've been meaning to blog all week about Barcamp Leeds, and to this end I've been nagged to the hilt. I've rather neglected this blog as of the late which is another story. So many things I want and need to say, but not the subject of this post. Last Saturday I attended Barcamp Leeds: 2007. This was a hearing geek event, which I'm going to write about but I will also try and throw in some Deaf perspective. Its an unconference, where sessions don't get planned. A group of geeks get together, throw about their creative energy and networks, and make the day what it is. Of course, this event does not happen by itself, and requires planning, commitment and sponsorship on the part of a few people, who deserve a thumbs up. So many conferences could learn from an unconference theme, as it forces participants to organise and be creative rather than being passive receivers. Deaf events especially, where everyone expects to be spoon fed, and through a traditional paternalistic attitude, hampers creativity. Instead lets encourage the creative juices to flow, and demonstrate how people can truly rock. What was special about this Barcamp, it had two Deaf attendees, and two BSL/English Interpreters. Except, I'd forgotten how much of a bubble geeks can live in, and what can only be labelled as a geek culture. On arriving at the venue, one of the interpreters asked, "Why is everyone taking photos?" The only answer could be given, "Because they are all Geeks" (with a capital G of course!) Mainstream people possibly have yet to latch onto the fact geeks record everything, and share their lives online. Such as uploading photos of the event to Flickr. This was my first mainstream geek event, and I'd been out of the loop for a while, so I was nervous. Whilst I can absorb uses of social software online, and have an early adapter streak in me, being in a physical space was another ballgame entirely. J and I had the conversation beforehand, 'What if we aren't geek enough', and perhaps started to feel a fraud. Had we robbed someone of their place at BarCamp, since the event was full and oversubscribed. However, one thing I'm particularly keen on promoting is reminding the mainstream we are out there, and to think of wider use of applications and accessibility, beyond the immediate obvious. The presentations we're really decided on until the start of the day, where attendees could grab slots and present on a topic of their choice. The presentations were numerous and three sessions happened simultaneously, so you had to take your pick which one you wanted to attend. From a Deaf perspective, the biggest downside was lack of detail on the content: 'live demo', what did that mean? Sure I loved the flexibility, and the relaxed attitude to it all, however the traditional me was yearning for more information to make better choices. The fact people were crowded around a board made up of post it notes, underlined the informality and on the spot creativity of it all, but I couldn't help think ... isn't there a tech solutions for this? Okay had wifi being used to post / view all this electronically, perhaps it would not had the same mash up feel to it. I'm not complaining, it was just a point that made me smile inside. I had two motivations for attending this session: multimedia content is usually not accessible for deaf people (the internet is going backwards in terms of deaf access, from a largely text based platform which was great to audio content) and the desire to encourage people to think about this; and secondly my curiosity needed to figure out where the 3.0 came in. How this as supposed to evolve beyond 2.0, which was about user interaction as opposed to take the information and go 1.0 approach? This session essentially was about tagging moving picture on IPTV. The example used in the presentation by Mark was tagging of characters through perhaps a series. Say you wanted to home in on character Joe Bloggs throughout a series, and how that character develops. Via prior tagging of his appearances, it would allow you to easily locate and thus just watch content where they appeared. Discussion took place around whether this would be useful, and questions arose around would such tagging lack context? However, I couldn't help but think of wider uses: tagging themes, and presentation modes. E.g. if a video contained BSL, and to use this as a wider application. To dig out BSL across the net is difficult, and via multiple tagging e.g. BSL + soap, would return x number of hits. A good way of retrieving information that had been decentralised. All this reminded me of Dabble. The session went slightly off tangent in re how hearing people will talk on the telephone at the same time as watching a particular TV programme, and whilst this is happening and more to the point discuss what was happening on tv. Parallels were presented how interactive television would would, discussion alongside media. As a side note I will sometimes discuss television on IM, but its usually as a passing reference: its sometimes difficult to watch two screens at the same time, where hearing hearing people have an advantage of auditory input. Interactive television via a computer could somewhat alleviate this, with the benefit of conversation / television happening on the same screen. In all a useful session, and made you think about where the net was going. This was quite possibly the presentation I enjoyed the most, because of its personal touch and another example of end application. My real interest is how people use online space to come together and create a social space and also collaboration. Software always has to be about end users. In a nutshell a group of bloggers created their own Whisky Private Members' Club, to distill their own whisky! My liking of whisky really does not have anything influence over bias here, honest! The club was set up in response to members being fed up of companies dictating to the consumer a product, and feeing powerless to change this over and above the usual laws of supply and demand. Here an economic model was taken further, by mass collaboration of consumers, and vast geographical space that arose out of specialism was overcome by using online tools, of a many to many nature. Membership cost over £3k, and in turn people came together to buy land in Scotland, pull a distillery together, plan a blend to be ready in 5 years time. The leases arising out of this purchase would last 50 years. In other words, some form of a business. What fascinated me was the trust that had been established through software alone, and the fact these people felt confident enough to go ahead an invest / set up a long term business. I think Ian cited another example of business partners who had been in business several months, yet had their first physical meeting / met for the first time several months later. This gives rise to the suggestion that blogging as a tool really can help you trust a person, whereas something like a forum it would be more difficult to achieve that level of trust. It underlined how different types of software could have a different influence on personal relationships as the end result. This I can relate to, I've collaborated with a couple of projects with people whom I would call 'friends', yet I've never met them in real life! And I've only known them online for 3-4 years, and speak to them practically every day. They possibly know more about me than someone who I would see in a physical space. There were so many parallels I could take away from this presentation, and it was good to get a totally different context or application. Deaf people reading this, its an excellent case study of what can be done, including the power of individuals to turn things your way. Ian's presentation slides can be found here. This was around GPS, and what was funny from a Deaf perspective was its application to hearing people. How looking at a GPS system you perhaps start to bump into things, or not appreciate your environment! Bumping into things like lamposts (usually because of watching someone signing) is something that Deaf people probably go through frequently! It was rather surreal to watch the principle applied to the masses. The idea was that you could either receive GPS information via audio, or via tactile information. It was the latter that interested me the most, and it was suggested on the back of a GPS device that a series of pins were placed. These pins would change depth when a point of interest was reached, this a person could leave the device in their pocket. Of course I immediately thought about deafblind people, and perhaps it could be a method of navigation. The other point from this talk, people could upload points of interest to their GPS device, for example history about the area, restaurants, etc depending on what level they wanted. This was good, but what would be even cooler would be an open API for this, where communities could create their own specialist maps, e.g. Deaf history maps, Jewish maps, etc., which would be cost prohibited by the mainstream. Presentation slides can be found here, and the visuals should explain this better. This presentation was around getting feedback to documents created, and enabling a two way street via an application called Edocr. I found it difficult to latch onto this idea at first, as personally, if I want to access information online, I expect it to be presented in web fomat and not documents. Thus I found it slightly difficult to get into a corporate mentality. However, I can see the benefit where companies would want this, and it kind of brings a compromise Web 2.0 approach to a corporate environment, in that it encourages constructive feedback from an intended audience via comments. Allowing users to view other comments, would encourage wider feedback, which in theory should be higher than expecting someone a random reader just to e mail to give feedback. Edocr encourages documents to be uploaded on a central website, which comes across as a hosted solution. However, I could not help think that some large companies or services might want more control of user feedback and content, and thus want the application installed on their own server. A bit like when it comes to blogging, installing Wordpress or Movable Type on your server, as opposed to a third party hosted solution. I immediately had to wonder if there would be a market for choice, to allow some companies to retain control? Not quite the presentation (the link for the presentation on SlideShare was a bad link), however here's the slides for similar talk: Wikis and Edocr. UK-Canada via the net, however this never happened due to technical issues. 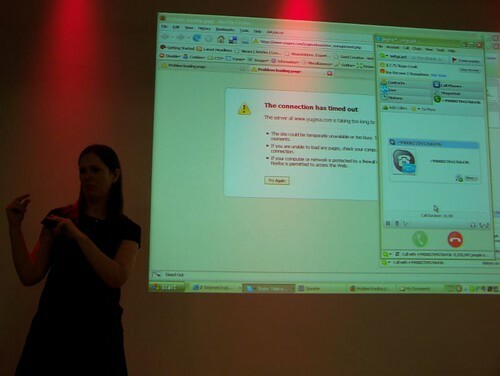 This presentation I landed in accidentally, as the interpreters had not moved when I went to get a drink, and ended up watching a presentation on computer human interaction! In a nutshell how to get a car from A to B via a lot of obstacles, with no human driver. This involved some sort of artificial eye, and huge monetary prizes (millions) paid donated by the Defence budget in the States. Immediately I had to think of other uses for this 'artificial eye', which could navigate obstacles. Could a variation be applied to blind, or deafblind people via auditory or tactile guidance? Of course I had to wonder if such an application used by others would work *with* a person, as opposed to an attempt to turn this around and change their being. (cf: the cochlear implant debate and Deaf people). There was a couple more ideas (read presentations) in this slot but by this time my head was mush. J and I left late afternoon, and by this point I was exhausted. For personal reasons, I had not followed an interpreter for that length of time for ages, and my eyes had given in, my head given up. My regret? I wish I had the opportunity to network in an informal setting later, but recognised I was still new to this scene. Perhaps next time. Apart from the brain food, a huge thanks to Imran Ali, Tom Scott, Dom Hodgson, Deb Bassett for the organisation of fab event and pulling together a group of cool people. Thanks for allowing me to experience such energy and inspiration, you all rock. Imran Ali: We Made a BarCamp! Speaking to Andrew Strachan of the BBC’s Future Media and Technology Accessibility Team, he was able to confirm that adjustable text sizes are going to be incorporated into the iPlayer set-up. “The subtitles display facility to increase size of text will be a new feature in subsequent releases,” he said. Sure, I get this line of reasoning, but I still cannot access subtitles in full screen mode, nor Windows Media Player. As stated in my previous entry, I don't want to watch this on a small screen. Fintan has also done a review on BBC's iPlayer, which is considerably shorter than my last entry complete with screenshots! So if you wish to get a summary, I would suggest you go read. Fintan also found that How to Be a Perfect Housewife has BSL! Seems BSL is subject to the same crappy navigation issues as English subtitles are. If Fintan had not blogged about this, I would have been completely oblivious that BSL was now available on iPlayer. What's the point in that? Make BSL available, and not tell anyone its there? As I already stated in my previous entry, BSL output is likely to be considerably less than subtitling, which highlights problems with navigation even more. Dear BBC - I know you are busy trying to get the BSL and subtitles on programmes, but it cannot be that difficult to create a new category and assign such programmes to it. This should not come from a diversity department anyway, and should be addressed by iPlayer's core unit. Categorise in the same way as comedy, factual, children's is. Deaf people should not be some added on feature to follow a good few months later. Thanks! The BBC is available on YouTube (channel only available in the UK). YouTube BBC Worldwide is available for those outside the UK. More about this on the BBC's website. One question: where's the subtitles? In fact I don't even see a button on YouTube to display captions if needed. When the BBC made a YouTube deal, why wasn't accessibility at the heart of this? The corporation will also get a share of the advertising revenue generated by traffic to the new YouTube channels. Both Google and the BBC is financially benefiting from this. The BBC is a public service, and it really is not okay to leave part of your audience out. As a large corporation, it has the negotiation weight to insist that subtitles are incorporated. So much for living in 2007, and access to be at the heart of decision making! For a company filled with PhDs, Google really does not have the excuse to knock some code up to make subtitling an option, to turn on or off. Yesterday I blogged about closed captions being available in various languages for Google Video. Since its the same company, why hasn't access been carried over at the outset? As a side note, I brought this point up back in June. I've got concerns re accessibility of YouTube for Ushers and deafblind, is the picture quality good enough to follow BSL (if that ever happened) or subtitling? I can't answer that question, as I don't fall into this category but as a person with good vision I know the quality of video on is not so good due to compression and how the picture is transmitted. Thus is a public service institution in danger of leaving out a significant chunk of the population? Here we go again, who do we write a formal complaint to? Google video now has closed captions in multiple languages. Shame people don't use it more though! However there's no English subtitles to be seen? I'm not sure if they are simply not there, or the choices are so many that it goes under the thumbnails at the top. Does anyone know how to resolve this? In the meantime, I'll just have to stick to subtitles in Welsh. The BBC publically launched iPlayer at the end of July. I've been a closed beta tester for since May, so I had the opportunity to try it out and had planned to blog about it before now (RSI has deterred me from blogging). I have some thoughts from a Deaf perspective, first, some background information. Is basically BBC catch up television, which can be downloaded onto your computer, via iPlayer software. Once downloaded, the programmes usually available for up to 30 days after the programme became available. However after its first viewing you can no longer access this after 7 days. Would have done this if I'd blogged about this before its general public release. However, I'm not going to do that now, as you can now find this information online elsewhere. Go to this blog entry if you want the basic screenshots and the rest from a mainstream perspective, and thus no point in wasting time reinventing the wheel. For a technology viewpoint, iPlayer is something of a disaster: DRM, will only work in Internet Explorer (for searching programmes), currently locked into Windows although a Mac version is meant to be available by the autumn, etc. There is even a petition to Number 10 on this, and to this end the BBC has responded saying that it will open up to other platforms in future. From a general observation (no scientific proof here), compared to my hearing friends Deaf people seem to disproportionately use a Mac or Linux. Thus where is their access to iPlayer, and more to the point signed television they were promised (see later comments e.g. See Hear)? It was thought that iPlayer wasn't available on Windows Vista, and official BBC advice still gives this. However there's some advice on how to run iPlayer on Vista on this blog (do so at your own risk). There's much more I could say about technical / political aspects here, but you will be able to find this elsewhere online. I don't dispute that the concept is a good idea, in that you can catch up on television when you feel like it, and have greater flexibility where you watch it. Say for example download a programme, then watch it on the train en route somewhere. As long as the quality of the programmes and the access is there (minus the bad DRM / locked in decision), a good investment on the BBC's part. It brings in greater audience numbers, and with this value for money moving away from traditional broadcast medium. The BBC says it will have 100% subtitling output on iPlayer by 2008-09, and to this end some programmes are already subtitled now. In glass half full mode, this is positive, and may this continue. However, should we tolerate waiting, more about that below. Firstly, the mechanics of all this. (There's no television picture in the screen grab as it doesn't pick it up, really annoying and will become apparent when I try to get screen grabs for BSL below). First, on a postive note, the subtitles appearing on a black background underneath is a good move accessibility wise for Ushers and deafblind. However, some people might have problems with the text and screen size, and possibly might prefer to view in a bigger window. I'm not qualified to give an opinion here, and would love to see comments / feedback from others. However, for me this screen this iPlayer screen is too small, especially when trying to read subtitles underneath. This kind of defeats what I said above re Ushers, and I'm having issues pretty much with 20/20 vision. My eyes are trained to read subtitles on a screen from a distance, usually on screen. Watching this size, I can't read a font that size and take in what's happening in the picture at the same time, or rather make it a relaxing experience. That's what television is supposed to be about, and small subtitles in a small screen doesn't quite do it for me. No problems, in theory I can switch to full screen. If subtitles are available for a particular programme, this will be shown on the programme Information page for that programme. If you're watching programmes using Windows Media format in full screen, subtitles might not appear. * Select Start on your computer, locate and open Windows Media Player. * Go to the Play drop-down menu and select Captions and Subtitles. * Select Tools on the top menu within Windows Media Player. * Go to Options and select Security Tabs. * Make sure Show local captions when present box is checked. * Select Apply button to save the changes. Following the instructions above will ensure subtitles appear in full-screen. You can only view subtitles using Windows Media Player. The subtitle 'On/Off' options can also be found within your BBC iPlayer Preferences. The option you choose here will control whether subtitles will be available in the BBC iPlayer playback console. However, if you don't select the 'On' option for subtitles in Preferences, you will still be able to select them in the playback console. (Click onto the image for a bigger picture). I would do some screen grabs here, just to show you, however again the screen grab doesn't work. As a closed beta tester, I fed back this information to the BBC iPlayer team, as I thought it was important / could perceive it as an access barrier. I got the standard thank you for your feedback e mail, however it was not actioned. Why does this problem still exist 3 months later? Local captions now selected on Windows Media Player, lets play! Hahaha - right now it doesn't work! After all that, I cannot get subtitles to be had in full screen mode. Subtitles exist in standard screen / cross eyed mode only. So I go back to the instructions above, root around some more and no joy. Absolutely no use to me, and on this very ground I've given up on iPlayer, until someone at Auntie Beeb starts to listen. I've fed back this issue and still waiting for someone at the BBC to enlighten me. This is not good enough. In addition to subtitles, iPlayer is supposed to be transmitting programmes using BSL (although not yet), a point I will come onto later in this blog entry. I am bringing this up here, as it shares a common ground with subtitling as far as navigation goes. Apart from the no subtitles point, the biggest issue with subtitling is navigation. "If subtitles are available for a particular programme, this will be shown on the programme Information page for that programme." The BBC expects me click onto each programme's description to check if it carries subtitles, and this information is not available on the selection screen. Clicking onto descriptions and back is time consuming. At the time of trialling iPlayer, not many programmes were subtitled, and I gave up trying to find a subtitled programme. Clicked 30, 40 times and got nowhere. Although this subtitling output has increased, its still not enough. To make my point, I just went to iPlayer and clicked onto random programmes in order to find a subtitled one. It took me six random attempts before I came across a subtitled programme. I don't have time to mess about, shot in the dark approach, to find a needle in a haystack. I want a complete list of subtitled programmes in one place. A subtitling category. Perhaps that marginalises us, however the BBC needs to keep me there not give up through navigation. Just clicking onto random programmes and finding out they are inaccessible simply makes me pissed off. Since 100% subtitling could be anything up to 2.5 years away, during those two years, are we expected to pay needle in haystack, and play a game "Find the Subtitled Programme". The BBC might as well put up Where's Wally, because that's how annoying it is. Right now we don't know what the deal will be re: navigation of BSL output (or what the BBC terms as Sign Zone). Will this be available in a category by itself, or will we be expected to navigate through other programmes? Either categories are needed, or a subtitling icon is displayed next to the programme name / picture, on the first navigation overview. Deafies everywhere are probably asking one question: if subtitles are provided for television programmes, why can't these subtitles be carried over to iPlayer? Why is there a need to wait until 2008-09 for a significant increase in output? Bit like how the BBC too frequently screens repeats on BBC 3 or BBC 4, and no subtitles yet the subtitles appeared on BBC 1 or 2. If there's some obscure technical problem for lack of subtitles not being able to be carried over to iPlayer, this needs to be communicated to us. As these are the sort of questions we are asking ourselves. Without information, people just get plain frustrated. The BBC has said that it intends to broadcast programmes from its Sign Zone on iPlayer, in other words target a BSL audience. I blogged about this back in April. Apart from See Hear being available during its closed trial, extensive testing has yet to happen. BSL on iPlayer is an interesting one, and something I have mixed views about. In principle its a positive move. However it should not be done at the expense of BSL transmission on television, and should be complimentary; not instead of. Somehow I have fears about the BBC taking us down the road of the latter instead of mentality. For example, the moving to See Hear mid week, and not giving people realistic options for viewing. Instead, suggestions to watch iPlayer instead. The last edition of See Hear (broadcast on the 7 July) was available on iPlayer with no subtitles. Not a promising move, especially with iPlayer shipment due out that month. However, it gave me an opportunity to access a programme just using BSL, and just focus access critique for this language. (I had not seen this programme on television). This particular programme had part been rather creatively pulled together through small screen shots, one box displaying a relay interpreter which I was expected to watch (to follow the BSL). (Please note that picture with the camera lens relatively close to the laptop screen, this doesn't really illustrate what I am about to say below). I really had to concentrate, not because of my BSL receptive skills. The quality of the picture was blurred enough, and became more apparent for a picture that size. I found myself becoming a bit cross eyed in the process, and ignoring the box next to the interpreter or Deaf person, as I had to focus on what was being said. TV is supposed to be a relatively relaxing experience, and this was not. I've seen such a set up being used on television before for BSL output, however it wasn't nearly as frustrating, and this could be for a number of reasons. Quality of the picture, the size of the television (in comparison to a laptop), distance you are placed between the screen (laptop or a computer tends to be placed much nearer). I'm no researcher into how people pick up such content, however I do know one thing: it was not pleasant. From September, See Hear will be broadcast in the middle of the week at lunchtime; a time that is inconvenient when many Deaf people are in work or studying. The BBC is now suggesting that Deaf people catch up with the programme via iPlayer. I have various problems with this, which is outside the scope of this entry, instead I wish to focus on the technical aspects. See Hear is going to have to either change the way it produces programmes from September, to accommodate BSL access via iPlayer. Having small boxes to watch some BSL on screen however cool and creative it might be, defeats the point of access. One has to ask the same questions about an in-vision interpreter on Sign Zone, in terms of picture quality. Will the quality be good enough for BSL? During the whole trial (pre end of July) I never saw the opportunity to try this out. This is a major failing, and BSL access is put on as an afterthought, or something to be developed later. Trialling BSL via your platform is imperative, should not be added on later. Take S4C's streaming of signed programmes for example, which I blogged about on Grumpy Old Deafies. A wonderful idea, and ensures that people like myself watch signed programmes. Signed television times are inconvenient to me, and thus why waste a resource you've clearly spent money on. However, right now I can't! The picture is too distorted to follow the in-vision interpreter properly. For a start, the face is a complete blur. Whilst the picture is insignificantly better with iPlayer, and the BBC's interpreter usually is bigger, will it be enough? My experience watching See Hear makes me ask these questions. Where is the BSL consultation, and more to the point was it taken on board? Perhaps a strange thing to add onto the end of this entry, but some mention needs to be made of setting up iPlayer. If the BBC intends to make available BSL programmes in this manner, and recognises BSL as a minority language indirectly through production of these programmes then it reasonably follows there is a need for instructions on how to set up iPlayer on the web via BSL. Currently, people with a good command of English have problems with setting up this platform, what about BSL users? There needs to be clear instructions and information in BSL, if the BBC hopes to utilise iPlayer as a platform for signed output. In summary, I have one comment to make: BBC start listening a bit better and more to the point implement this feedback. BBC breaking the law in respect of See Hear? In Krakow, Slask, Podlasie, and Szczecin, police arrived at the suspected subtitlers’ homes at 6 a.m. — and took them into custody. 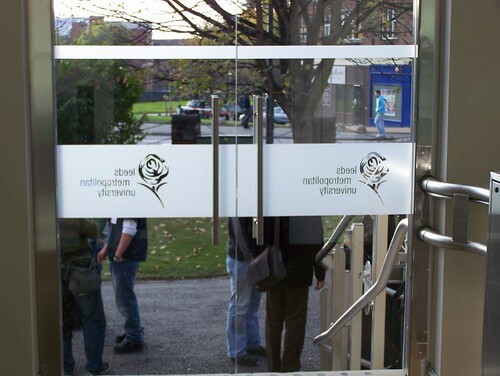 The story first appeared on the Polish Linux site, which states that “According to Polish copyright law any ‘processing’ of others’ content including translating is prohibited without permission.” Newspaper accounts report that the detained subtitlers face two years in jail if they’re convicted of illegally publishing copyrighted material — presumably including translated movie dialogue. Bush administration recently put Poland on a copyright "priority watch list," threatening economic sanctions if law enforcement in Poland did not take more forceful action against infringement. A threat of economic sanctions against e.g. Poland: if you don't sort out the iissue, then we will stop trading with you. US government throwing its weight around, and resorting to bullying smaller countries here? I am not going to dissect that here. However, I would like to ask the question, are firms or initiatives getting penalised, because people (who hold the original copyright) be bothered to make their content accessible in the first place? Will this affect how Project ReadOn and dotSUB plus any other subtitling output operates? What about genuine subtitling initiatives, because the mainstream cannot be bothered to be inclusive at the start? Are these initiatives automatically described as "rogue"? In the meantime we are supposed to be denied access, until the companies get their act together, or some law is passed? "People are increasingly using Skype to interact with one another, with many choosing to play simple games like checkers or backgammon," Amery said at the keynote. "However, the tremendous size of Skype's user base makes it an ideal environment for multi-player and community-based games in which people can play against or collaborate with one another." Whilst these games would only be playable via Skype, and there's issues whether gaming developers will bite the bullet. However, you can see the trend as far as VoIP goes. Imagine trying to use Second Life of WoW, and insisting that people use text to plan e.g. raids in WoW. Increasingly we are seeing the net mirror society, as far as inaccessibility goes. For the past 10-15 years, Deaf people have enjoyed a relatively easy oasis: the net suddenly presented a world without barriers, information and interaction was accessible. I fear that is about to end, and we are about to take a full loop. Instead of advancing, in many respects the net is about to go backwards. Solutions need to start being developed at the same pace as mainstream advances, with accessibility being a central theme, and not an afterthought. I banged on about Joost last January, where's the subtitles? The only thing I can access is Aardman Productions, and Morph. A side note for international readers, Morph came about because of the need for BSL on television, and first took the form of Vision On. Morph takes me straight back to childhood! How many Deaf people are involved with beta testing and do they actually get a say in respect of access? There's a thread on the Joost forum in respect of subtitles, interestingly this was not initially presented as a DEAF need, but for speakers of other languages other than English. Joost has just raised another $45 million in respect of financing, this is presumably on top of the $2.6 billion previously raised. Since they are going to be showing content, e.g. from CNN, does the contract(s) say anything about an obligation to subtitle its output? What laws do you have in respect of captioning, and can it be extended to cover internet television? I feel a bit powerless here, since Joost is based in the States I know nothing about subtitling / captioning law in that jurisdiction and furthermore how to enforce this. The breaking down of jurisdictional boundaries is redefining the need to understand law around access in other countries, something we as campaigners have had little need to do before. This raises all sorts of issues around the need to create more international partnerships in future. What I really would like to see on Joost is a sign language channel. Lets have this mainstream, as part of another service. Don't marginalise. And let Deaf people be involved at the core of this, and more importantly lead. One has to be careful here, and ensure a distinction is made between decentralised content (something I've been vocal about recently) in the form of vlogs, with pure television. If you want a Joost invite, just drop a comment in the box below (include a valid e mail address in the e mail field) or e mail me direct, and I'll wing one your way. Firefox extension to work with third party subtitling sites? I got your e mail address from Deaf UK Technology, as an e mail of yours was sent there a couple of months ago. You introduced yourself from Access Firefox and were interested in what Firefox extensions Deaf people wanted. being played, and to have the choice of turning this off, or receiving a notification (if I wanted it) that sound was being played. Since then, there has been some developments in respect of subtitling online, by third party sites. Instead of repeating myself here, I blogged about this. Would you mind taking some time to read this? This issue is not going to go away, and I see it as becoming more of an issue. Since one firm cannot subtitle everything on the web (unless your name is something like Google), I can see this becoming a multi company market. e.g. Legislation in the UK for example may push up demand anyway, and with it could be some outsourcing. (I am not suggesting that subtitles away from the main site is the best idea, however, I can see it being one example of a solution). So how do Deaf people keep up? Expect us to visit each and every site to check if something has been subtitled or not? To this end, I believe that a Firefox plugin can assist here, not only from the Deaf person's perspective, but the company's too in that it continually reminds users they are there (bit like RSS in this respect). Hopefully, if such a plugin is developed, to include a bundle, where Project ReadOn, dotSUB, any other players are included as a default. Other providers to be added if they enter the market. I appreciate this would mean some open source standard / API by subtitling sites, in order for these sites to talk to a subtitling version of BlogRovr. I wonder if some partnership could be worked on? Please forgive me for being forward here, but I would really love to see this addressed. I've copied this into dotSUB and Project ReadOn plus the Open and Closed Project, for their information. I've also copied this into a couple of Deaf people too, as they may be able to offer a perspective. Unfortunately, I don't have an e mail address for BlogRovr, however there is a contact page on their website if this is a way to go. Just to let you know, I'm also going to blog this, as its something I would like to actively encourage discussion. If you have an interest in this field, or something to offer please use the comment box or blog about this and link back. We really need some discussion around this, and for Deaf people to lead the way in what they want. IBM addresses multimedia access for blind. Deaf access where? Vlogging grows, where's the subtitles? Last week I came across this TED video of Evelyn Glennie: How to listen to music with your whole body. In this soaring demonstration, deaf percussionist Evelyn Glennie leads the audience through an exploration of music not as notes on a page, but as an expression of the human experience. Playing with sensitivity and nuance informed by a soul-deep understanding of and connection to music, she talks about a music that is more than sound waves perceived by the human ear. She illustrates a richer picture that begins with listening to yourself, and includes emotion and intent as well as the complex role of physical spaces -- instrument, concert hall and even the bones and body cavities of musician and listener alike. Except on the website, there's no subtitles. My first reaction: p*ssed off, etc. Secondly, the website has enough sponsors on there, to easily get funding for subtitling. TED can afford it. Moving on. All this caused me to wonder, has this been subtitled already? Perhaps at Project ReadOn or dotSUB. Since I can't find it, I assume not, but I can't be sure. Have I searched properly? How do I know if this video hasn't been subtitled elsewhere? Am I expected to go to each individual site and check? Do an extensive online search? Even if I had video notification via RSS from these sites, who said I could remember everything that appears? I'm not going to. Hopefully, such services are likely to grow in future and a solution needs to be thought of now. I would like a Firefox extension developed, that works pretty much like BlogRovr but for subtitling. When I go to a site with video, I would like a pop up box to appear to let me know where a video has been subtitled. Just as when you install BlogRovr, it suggests sites that provide subtitling services (to be monitored). In addition, if and when new companies come onto the market, you can add these / configure your extenstion. Call it SubRovr or something? This of course would require some kind of open standard API or blog on the part of existing service providers so they can communicate with the Firefox extension. Could Access Firefox, Open & Closed Project, subtitling providers and Deaf geeks and anyone else who's interested actually work together to make this happen? Someone using technology for a good cause and not just to pump out more megapixels or whowhatsits per second. Wish sites would see past feeling sorry for us or rather people trying to help Deafies, and actually step back here. I for one would like an objective review of VeeSee, from the mainstream. If this was a mainstream site, what would you say? See past the sign language, and what's your take as an iPTV site? Note to Crunchgear: yes I get the whole long tail thing, and the point of your post re niche markets. 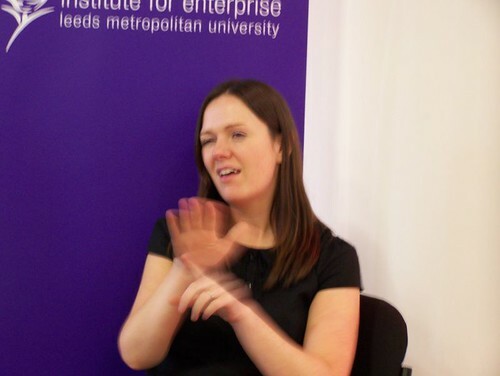 Specifically relating to Deaf people, there is a need to utilise developments online particilarly around sign language. There is much needed to be done also, particularly in respect of inclusiveness. To this end, I would call on people like Joost and venture capitalists, to work in partnership with Deaf companies such as Remark! (and its counterparts in other countries) to produce sign language iPTV. Allow the mainstream to educate and work in partnership with minority communties, to share knowledge. Such initiatives have to be done in partnership with and led by Deaf people. Deaf people reading this post, I would encourage you to participate here, to get our ideas across to the mainstream. Speedbit has had a million downloads in 49 days. A million people via word of mouth can't be wrong! It speeds up videos via YouTube. Good for watching signed videos, and no need to press pause to wait for the thing to load. Shame this doesn't work with other video output online, could really make use of it on other applications. Vee See makes BBCi News Technology: Paternalism 2.0? VeeSee is currently the top story at BBCi Technology News page. Where's the impartial reporting by the BBC, and go beyond the reporting its done to question the set up? This is one sided reporting. The issue with DEAF stuff, is that media outlets can infrequently see past the charity case that and their interpretation of people with broken ears might be, which leads to somewhat odd media reporting. It is Deaf Awareness week in the UK, thus people come out in droves to show how they are helping us. Don't get me wrong, I want signed content on the web, and do not want to knock effort down. However, this is locked in centralised content, which the rest of the web is moving away from. UK Deafies existing in their own bubble? I get the drive for a tv channel online, and something flagged for years by various people. I would also question if this is actually tv, but instead locked in vlog style videos that could easily be hosted on respective sites. We really do not need paternalism 2.0 in the UK? Why are Deaf people of the mindset over here that they cannot host their own sites, blogs and vlogs, and need someone to hold their hand? Makes you all come across as charity cases. A few weeks back, Chris Pirillo was communicating to an audience via ustream.tv. Chris was talking via a box, and anyone who had stumbled on the page could participate in a text chat underneath. Except I couldn't understand what Chris was saying, yet got the one sided conversation via the text chat. Apart from the fact I could see the implications for interactive television specifically sign languages, and bilingual communication here, I became frustrated. All I could see was online space that made my world more accessible 10 years ago, was about to go full circle. The inaccess gap was becoming wider again. Incidentally, I experienced the same thing watching Scoble casting from his car the following day, except it was a bit more visual so slightly easier to put up with. Back to Chris' chat. I entered calling myself DEAF, just so geeks would immediately get it. I said that I couldn't understand a word, great idea but where's the subtitles? Robert Scoble answered saying something along the lines of it was too expensive. Since Mateo Gutierrez had recently contacted me to let me know about Project Read On (which I meant to review, but life got in the way - its since been reviewed elsewhere, will possibly come back to this). I gave Scoble this link, just to let him there was possibilities or solutions out there. Robert replied that he was happy for his videos to be hosted anywhere, so they could be subtitled. Bottom line: I've always wanted to access the ScobleShow. Incidentally, I'd flagged this up with Robert before via his blog, and he had responded regarding the need to budget for this. Since mentioning Project Read On, I've become aware of dotSUB acts like a Wikipedia when it comes to subtitling something. Anyone can volunteer to subtitle stuff, and text can be modified, added to etc. - There needs to be some decent discussion around access, with the view of access online in the future. It would be cool if self regulation could come out of this, but has experience taught us that relying on goodwill is not enough? I get the self governance of cyberspace, just media content will increase through these streams in future. How are we going to interact?